The Beta for Halo 5: Guardians recently ended, and it looks like a hell of a lot of people played, which in turn means a hell of a lot of people have something to say about it. 343 industries Executive Producer Josh Holmes has been taking all of this on board, and has outlined what exactly will be changing in time for the games launch. 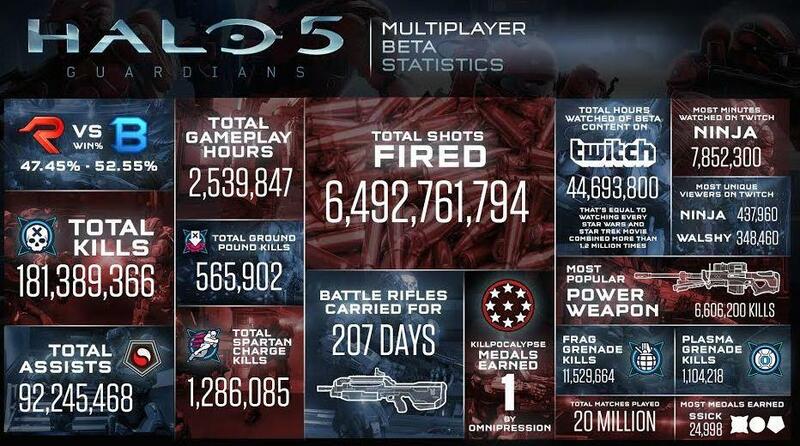 But before we get in to the changes, take a look at this info graphic, it has some pretty astounding stats. All of this happened in about a month, that’s pretty impressive! Now, on to the changes. A recent post on Halo Waypoint went in to detail about everything that will be happening. That pretty much sums it up. You can check out the full post here. I think that all these changes sound really good. I enjoyed the Beta a lot, and it felt like a good evolution of the Halo franchise without taking it too far away from its roots. Let’s hope the final product lives up to the hype!